The Advocates Have a Video! The Hope for Haiyan Advocates are a group of young leaders that are dedicated to spreading awareness and support for the disaster victims in the Philippines. 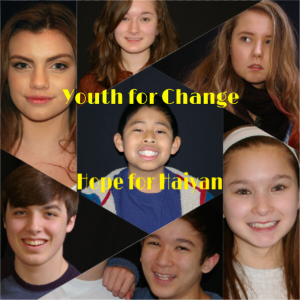 They’ve made a video that describes Hope for Haiyan is all about. Click here to watch it! Send us an email at info@hopeforhaiyan.com to learn more! Hello, my name is SirBobSponge. I am new to blogging and I would like to tell you a little bit about what happened on January 25, 2015. I just found out how many heartbreaking events occur in the Philippines, not only do the citizens suffer from horrible natural disasters, but they all suffer from a corrupt government and war like events killing many innocent people. A unit of Philippine Police raided four huts in the swamps of Tukanalipao, Mamasapana, Maguindanao, killing Zulkifi Abdhir. He is believed to be the leading member of the central committee. After this event the police believed that bad reactions would come from the rebels in the future, especially from the Islamic freedom fighters who are still in a state of war with the Philippine government. On the other hand the Moro Islamic Liberation Front had just signed a long lasting ceasefire with the government. With the troops withdrawing, the groups began to exchange fire and troops were cut off. By the time the Ad Hoc Joint Action Group were able to enter the area and stop the fighting it was too late. The groups admitted that 44 commandos were killed and others were wounded. Local Moro Islamic Liberation Front forces claimed that 64 from the others were killed, including local guides and informants. After this I believe that the government should reconsider the peace process. Also, my heart is with the families who lost their beloved and their friends, it is impossible to understand the grief they are going through. What do you think could be done to avoid something like this again? Should we continue the peace process or Postpone talks with the Moro Islamic Liberation Front and review the deal?